The Siamese Fighting Fish is one of the most spectacular fish that lives in river basins of Southeastern Asia, from Thailand to Borneo. Although reaching only 60 mm in length, they have an impressive visual appearance, because of the long, colourful fins, that can be in almost any colour, from completely black to bright red. They’re also appreciated as aquarium pets, being an interesting addition to any home. These small fishes prefer small lakes, slow rivers and canals. They’re fairly fastidious and will never inhabit unclean waters. Siamese Fighting Fish stay near the surface of the water and because of that will almost always stay in waters where weeds are abundant, thus offering them cover from waterbirds. They are territorial fishes that heavily guard their chosen territory as well as their rights for mating with a female in the area. Siamese Fighting Fish feed on weeds, small worms and carrion, thus they are omnivores, which means they eat everything. They are quick developers and reach maturity fairly quickly, but rarely live longer than 2 years. Most of their life revolves around fighting between each other and mating, they never show hostility towards other species of fish. 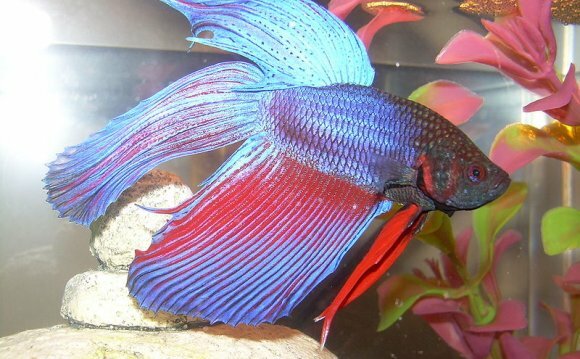 Siamese Fighting Fish have obtained their name for the males being extremely aggressive towards each other. When the mating period comes, males attack each other for the rights to mate with a female. Males use their long fins to scare their rivals and the longer the male’s fins, the more likely they’re to succeed. Ironically, if this strategy fails and the males start fighting, the one with the longest fins will most likely lose, because the fins are very sensitive and also somewhat limit the fish’s movement. If the males succeed in beating all the rivals and impressing the female, they quickly start copulating. The female releases caviar in the water, which the male fish fertilizes and then takes to the nest, built earlier. Females don’t show any interest in the eggs – in fact, they will often try to eat them, which is why males try to drive the females as far away from the nest as they can. Males guard the eggs until they hatch, which shows that they’re not all that ruthless. In Thailand, Siamese Fighting Fish have been raised in aquariums for many centuries. The fish kept in captivity are more spectacular and more colourful than their wild brethren. Their aggressiveness has made them very popular and fights are being held between the males. These fights most often result in a casualty, as the male’s short, sharp teeth are excellent for ripping the competitor’s fins and pulling out the scales. Because of their steady reproduction rate and increasing popularity, the Siamese Fighting Fish hold a steady population and this species is not endangered.